At PGA, we overhaul engines to one standard: New Limits. We have chosen to forego the “smoke and mirrors” approach used by others and instead concentrate on supplying our customers an overhauled engine that delivers the power and reliability of a new engine combined with an established reputation for making it to TBO. Join us as we follow an engine through our facility. When your engine arrives at PGA, it is assigned a work order number and a bound workbook that incorporates our quality assurance plan. The workbook covers your engine internally and externally, from front to back, and stays with your engine through every step of the overhaul process. Workbook entries provide full details of each parts condition, work required, and who accomplished the work. 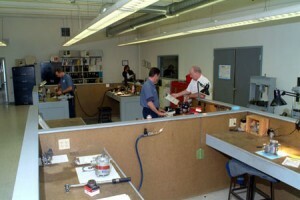 In each phase of the overhaul process, workbook entries are reviewed and verified by the the chief inspector prior to proceeding to the next phase. Paperwork ready, your engine moves to Disassembly. Disassembly starts with a complete set of photos and a listing of all accessories received by part and serial number. 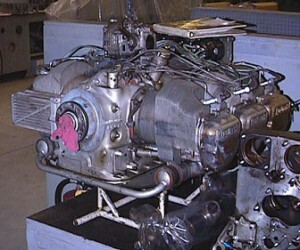 The engine is completely disassembled, and accessories are sent to our in-house accessory shop for overhaul. A preliminary inspection is made and then all engine parts and components are thoroughly cleaned. After cleaning, the engine moves to Inspection. This phase begins with the Zyglo inspection of the crankcase, Magnaflux inspection of all steel parts, and all applicable parts are dimensionally inspected for compliance with New Limit standards. All remaining parts are visually inspected for any abnormalities. A review of AD notes and Service Bulletins is then accomplished and we generate a complete list of all parts required, and additionally itemize all repair work that must be performed in order to insure “new limit” status. Parts that can be repaired then go to Repair. Our extensive repair facilities allow most repairs to be accomplished in-house, saving you both time and money during overhaul. Critical parts such as cylinders, crankcases, crankshafts, camshafts, and connecting rods can often be brought back to “new limits” instead of requiring expensive new parts. After repair, crankcases are assembled and torqued with new bearings installed so crankshaft and camshaft journals can be measured for proper fit. 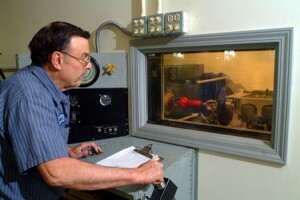 All measurements are permanently recorded for each engine. When all the repair work is completed and signed off by the technicians, the chief inspector reviews and insures 100% conformance with the manufacturer’s specifications. Once the chief inspector approves, the engine is ready for Assembly. 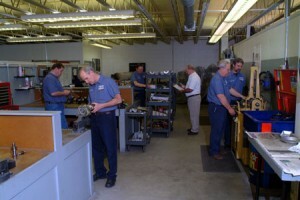 While your engine is being overhauled, our accessory shop technicians are busy overhauling your engine’s accessories. Starters, alternators and magnetos are overhauled in-house. Carburetor and Bendix fuel injectors are available for exchange. We are constantly expanding our accessory overhaul capabilities with the goal of doing 100% of our accessory overhauls in-house in the future. Our ability to overhaul most accessories means your accessories receive the same high quality workmanship your engine receives, and it helps hold down the cost of your engine overhaul too. 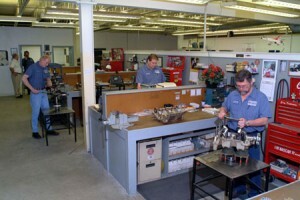 Our most experienced and seasoned personnel, trained in every phase of engine overhaul, assemble your engine. We use a “work center” approach to assembly, which means the engine remains in one assembly location from start to finish. Our assembly technicians follow a set pattern of inspection and assembly that includes numerous designated checkpoints by the chief inspector. After final inspection and chief inspector acceptance, the completed engine is ready for Testing. Every PGA engine is run in our test cell prior to delivery. By starting the “break in” period in this controlled environment, we allow critical components to properly “seat” together. Another major advantage of a test cell run is it allows us to deliver you a proven engine with fittings and fasteners properly re-torqued after the test run. We pride ourselves on delivering a finished engine that is ready to be reinstalled on your aircraft and that you can expect, with proper care and maintenance, to reach TBO.